The worst-kept secret in gaming is no longer "secret," as Ubisoft has revealed the cover art for the next Assassin's Creed, Assassin's Creed IV: Black Flag. The game stars a new pirate assassin and turns its focus to the Caribbean, mixing open-ended ship-based exploration and combat with land-based adventures on a number of Caribbean islands. 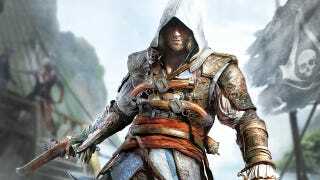 The fact that this year's AC would be Black Flag—and that it would be more of a nautical adventure—was becoming more and more clear on Tuesday, as a poster leaked to Kotaku, showing both the new character on its front and the game's map on the back. But let's drop the pretense of "breaking news" for a moment and let me level with you, folks. I was shown Black Flag this past Monday. I already knew this was the new game even prior to us running those two poster images. As is standard, I'd not informed my reporting team about most of the game's details, freeing them to react genuinely if anything came up. On Monday, I had talked to two of the game's creators, saw a presentation on the game and some video footage. As is common with seeing games early, I signed an embargo agreeing not to talk about what I'd seen and been told—in this case for a full week, up until noon Eastern on March 4. The advantage of an embargo is that it allows the people showing a game to present something in an unhurried manner and allows the reporter to take time to compose their thoughts. Some embargoes are signed documents; others are verbal agreements. They're not unique to corporate game publishers (plenty of indies request holding coverage until a certain date, though typically only verbally), and they're not unique to covering games. That said, the severe disadvantage of embargoes is that they put us in the position we found ourselves in on Tuesday, a day after I saw ACIV, of not being able to speak freely to you, the reader about material we're publishing. By Tuesday, as anonymous tipsters began to send us the images of the front and back of a poster that none of us had seen in person—but that squared with the game I'd been shown—we faced a conundrum: 1) refrain from publishing what we knew were valid tips that would be of interest to our readers, thus failing to honor our commitment to informing our readers about compelling news, 2) play dumb and publish, while pretending we didn't know the images were probably real, thus intentionally misleading you, the reader, 3) potentially tick off Ubisoft to whom I gave my word we'd hold off on covering the details of my briefing until March 4—a date that began to seem like it was tied into a pre-order incentive. In both instances on Tuesday involving those poster images, the instinct to inform you, the reader, won out. Cynics will say that the instinct to get pageviews is simply what won out, but that is inherently intertwined with a sense that it is anathema for a news outlet to ignore compelling news tips—for a week, no less. It is reasonable for the creators of any video game to ask that their new baby be kept under wraps for a time and to ask for such an agreement from the reporters to whom they show it. But it is maddening to not be able to level with you guys and gals; it is unacceptable for us to sit on news tips sent to us independently; and it is nauseating to recognize that this situation was partially of our own making. Some may say that the simple solution is to refrain from signing future embargoes, but, as I wrote above, verbal agreements are common on this beat and often are simply a matter of courtesy—the price for seeing something rough-edged a bit early. In the future, we can be more clear with those who show us games that we will run tips that are clearly sent to us independently and that, if and when we do, we will have to be able to more clearly acknowledge their veracity. We will never leak information ourselves, but we can't sit around and fail to report when information starts leaking. If that spites us some access, so be it. I don't want Kotaku readers waking up on any future March 4ths feeling they were misled by our site. We worked hard to not seem like we were playing dumb in our AC IV posts this week, but that doesn't feel like it was enough. So, yes, look for more AC IV coverage from me on Monday. I still feel I should honor my agreement to not divulge the many, many things that were shown to me about the game that haven't leaked. But, rest assured, we'll do everything we can to make sure this kind of awkward situation doesn't happen again.